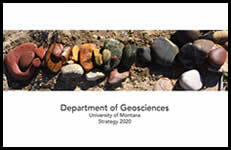 All geoscience courses that fulfill natural science general education requirements. Satisfy part of the Geosciences B.S. Degree or Minor Lower Division Core requirement. Credits: 3. Offered autumn and spring. General principles of physical geology including the work of wind, flowing water, glacial ice, gravity, earthquakes, volcanoes and plate tectonics in shaping the earth. Credits: 1. Offered autumn and spring. Prereq. or coreq., GEO 101N. A series of laboratory designed around basic geologic processes and materials. Familiarization with common minerals, rocks, land forms, and structures. Credits: 3. Offered autumn and spring. General principles of environmental geology, including the spatial and temporal frameworks involved, Earth’s materials (minerals, rocks, water, air), natural hazards, water and air pollution, energy, water, and soil resources, flooding, coastal erosion, and climate. Credits: 1. Offered autumn and spring. Prereq. or coreq., GEO 103N. A series of laboratory exercises designed around the investigation of environmental geology problems, including natural hazards, water and air pollution, energy, water, and soil resources, flooding, coastal erosion, and climate. Fulfill natural science general education requirements but do not count toward completion of a major or minor in geosciences. Credits: 3. Offered spring. This course introduces general principles of oceanography, including the origin of water and ocean basins; marine resources; atmospheric circulation; air-sea interaction; ocean-climate feedback; currents, tides, and coastal processes; marine ecology; and use and misuse of the oceans. Credits: 3. Offered spring. The evolution of plants, invertebrates and vertebrate animals, highlighting major events in the evolution of life on Earth. Includes laboratory experience with fossils. Credits: 3. Offered spring on-line. This course introduces the scientific context and latest research on natural hazards and disasters, including storms, flood, drought, mass wasting (landslides and avalanches), earthquakes and tsunamis, volcanic eruptions, and wildfires.